Cumulative update build 14393.448 and mobile build 10.0.14393.448 info. Update: Windows 10 Mobile 10.0.14393.448 released. Old Story: Microsoft is now testing new cumulative update for Windows 10 1607 Anniversary Update users. 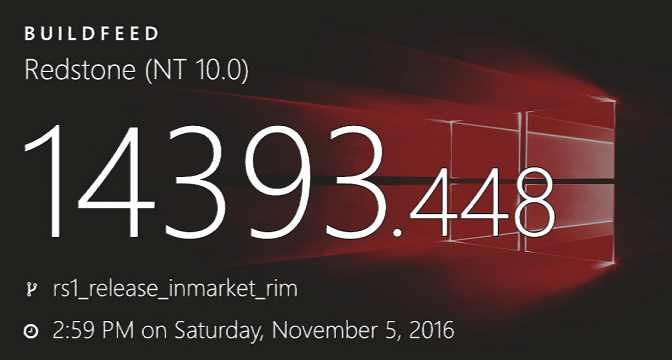 The new cumulative update build 14393.448 and mobile build 10.0.14393.448 were compiled on November 5, 2016. Before this build, the company already tested update build 14393.443 and build 14393.444. The cumulative update build 10586.679(Threshold 2) and build 10240.17157 (Threshold) are also under testing. Windows 10 1607 build 14393.351 is now available. Microsoft also released build 14959 to fast ring insider members. Windows 10 preview build 14931 is also now available for Slow ring insiders. You can download ISO from here.